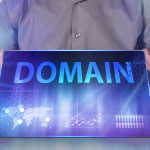 Org vs Com: Which Domain Extension is Better? When websites first became available to the public in the 1980s, users could pick between a handful of different domain extensions including .com and org. Back then, a solid demarcation line was established between commercial businesses representing .com websites and non-profit businesses representing .org ones. Today, this delineation is still common, but with some key exceptions: A non-profit business may use .com if they’re selling products online, and a for-profit business may use .org if the website is informational, or forum discussion-focused. Finally, there is a case for purchasing both .com and org (as well as other top-level extensions, like .net and .biz) in order to prevent a competitor from using them. *Special offer only through Fit Small Business; regular price $7.99/month. The majority of businesses today have a .com extension, mainly because it’s the most popular and trusted by consumers. As a matter of fact, a staggering 46.8% of all domain extensions are .com websites. While .com can be used by any type of website, it works especially well for businesses who want to advertise or sell their products online. In an era where literally anyone can create a website, a .com domain proves you’ve made an investment, and adds some authenticity to your brand. This is especially important to consumers who are increasingly wary of online scams. However, even in these situations, a .com domain is often still a good idea. For example, a non-profit business may still want to use .com if they’re selling products online. Take Summit Ice, a nonprofit winter apparel company who uses the URL summiticeapparel.com. This is likely because consumers are accustomed to entering “.com” when shopping online. Summit Ice, wisely, wants to ensure this traffic makes it to their website. This is also why it’s a good idea to find a unique .com domain, even if your top choice isn’t available. When you opt for an alternate extension, like .org or .net, you risk losing visitors who typed “.com” instead. To find a unique .com domain, try adding additional words, like your trade name (smithplumbers.com) or your location “smithplumbersnyc.com). See our top 25 domain name ideas for additional tips. While there aren’t as many .org websites out there compared to .com ones, this particular domain extension has its fair share of advantages. The .org extension stands for ‘organization’. Trade groups, non-profit organizations and developers of open source software are the common groups that choose .org extensions. For these types of businesses, a .org domain can often get more engagement than .com because it’s seen as more accommodating to visitors who have no intention of purchasing anything. Websites with a .com extension are mostly profit-based and company-owned. When a user is gathering information from a .com website, they’re usually aware on some level this information is trying to drive them to make a purchase. On the other hand, .org websites are seen as more genuine sources of information. Just consider some of the top .org websites out there: Wikipedia.org, Archive.org, Cambridge.org, or NPR.org. If the goal of your website is to provide educational content, or build a community forum, a .org domain is often more suitable. On the other hand, if you’re aiming to make the maximize sales from your website, a .com domain is usually better at driving profits. If your business has both goals, you might just consider using both domains: A .com to advertise your products or services, and a .org website for community interaction. Or, simply buy the .com domain and redirect it to the .org. One of the biggest concerns entrepreneurs face in choosing between domain extensions is the effect it will have on their SEO efforts. In reality, there isn’t really much difference between a .org or .com website in terms of ranking higher on search engines. Studies have proven that domain extensions have little effect on the SEO ranking of a certain website. The only time there’s an impact is when you’re trying to rank in local search results outside the US. Local searches tend to favor domain extensions for that specific country/region (.jp, .uk, etc.) more than the others. In the US, this doesn’t matter since very few websites use the .us country domain extension. If you’re still debating between an org vs com URL, simply consider the goals of your website: If you’re trying to advertise or sell products, go with a .com. If you’re trying to provide free information, or build an online community, go with .org. At the same time, never dismiss the idea of using more than one domain extension. You can always redirect one domain to the other. Or, when you sign up for a “Plus” hosting plan from Bluehost, you can create entirely different websites at no extra cost. Bluehost provides your first .com or org domain free when you sign up. 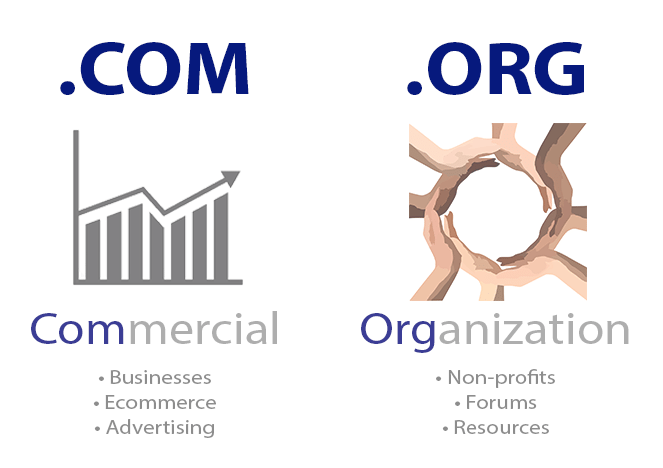 There is no difference between .com and .org regarding ownership or profits. Both are owned by you, and you can do whatever you want as far as displaying ads or selling products. 1. 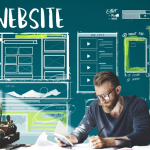 Traditionally, com websites were for businesses and org websites were for non-profits. While this is still somewhat true, there is no official policy. It’s just a cosmetic preference. 2. You technically never “own” a domain because it has to be purchased through a registrar, just like a phone number has to purchased through a phone company. It’s basically the same thing as “owning” it, though, since nobody else can claim it unless you stop paying the annual fee.